Girls of all ages around Brisbane are proving that skateboarding is not just a sport for boys, thanks to local group Girls Skate Brisbane. The group was created by three female skateboarders – Indigo Willing, Evie Ryder and Tora Cordelia – who are keen to break down barriers faced by female skaters. Girls Skate Brisbane runs events and competitions for female skaters of all ages and ability level, as well as regularly hosting a variety of coaching events providing an online network for young skaters and their parents. Co-founder Evie Ryder, who is a social worker, a filmmaker and a skate coach, said Girls Skate Brisbane was about building a skateboard community. “It’s not so much an organisation, more like a group of friends who want to build a community to skateboard with and have fun,” Ms Ryder said. The Group’s most recent event, ‘Rock Up and Rip’, which is in its second year, brought a community of female skaters together to help increase their skateboarding skills, have some fun and get to know other female skaters around Brisbane. Ms Ryder said sponsors were important in helping get the events off the ground. “We have different sponsors for different events,” Ms Ryder said. 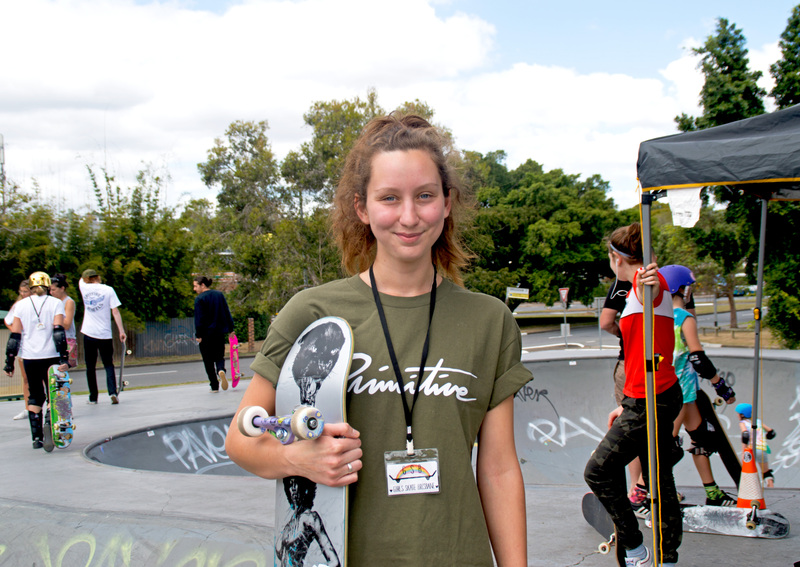 “There is a lot of community support from local councils to groups like Australian Skateboarding Community Initiative, but most of the work is just local skaters volunteering to get together and skate,” she said. Dr Indigo Willing, who has a PhD, a Masters and has received a Medal of the Order of Australia for service to the community, said as an academic woman in the skating community she rebelled against the stereotype that skating was a male sport. “There were guys always saying ‘there’s no girl skaters’ and girls always asking ‘how can we meet up with other girls to skate with’,” Dr Willing said. “We knew there were girls out there skating and [we] embraced a DIY approach, mixed with lots of experience in our community work elsewhere, to create a hub for Brisbane and South East Queensland girl skaters,” she said. Dr Willing said Girls Skate Brisbane aimed to showcase a mixture of talent to encourage young girls to feel accepted in the industry no matter what their skill level, and to increase media representations of female skaters. “We use social media and film to document our participation and history, to make girls more visible as skate media often only show the dudes,” she said. Ms Ryder said there was a certain amount of stigma involved in becoming a female skater, but said overcoming stigma was about putting yourself out there and pursuing your interests no matter what. “It’s a bit like when your fall off your skateboard, it can really hurt and scare you from ever trying the trick again,” Ms Ryder said. “But along with stigma and falling off, there is the great feeling of landing your tricks and a strong skater community of all genders who are always there to support and celebrate with you,” she said. Skater Miranda Heymink, who volunteers with Girls Skate Brisbane, said the way the group operated was structured enough to feel safe but laid back enough to allow for the “chilled vibe” that skating evoked. “Girls Skate Brisbane will always make sure the events are carefully thought out and planned, ensuring the safety of all the participants, but still have a very warm, calm yet fun atmosphere,” Ms Heymink said. 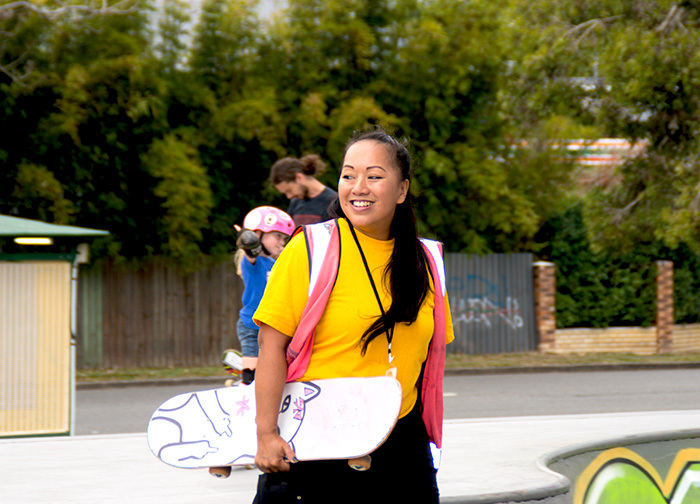 Ms Heymink is an example of how the Girls Skate Brisbane community works to ensure everyone single person is encouraged and nurtured. “I first got into skating when I reconnected with my old special friend Grace, who had been skating for a fair bit and decided to encourage me to hop on a board,” she said. Ms Heymink said the Girls Skate Brisbane organisers were friendly and encouraging, and were always on the move, darting across the skatepark to talk to everyone. “I know Indi [Dr Willing] is my skate mum,” she said. For more information about Girls Skate Brisbane, visit their facebook page.